At Centro Islámico in southwest Houston, don’t be surprised to hear both as-salamu alaykum and buenos días. In Islam, the Friday congregational prayer is called the jummah. 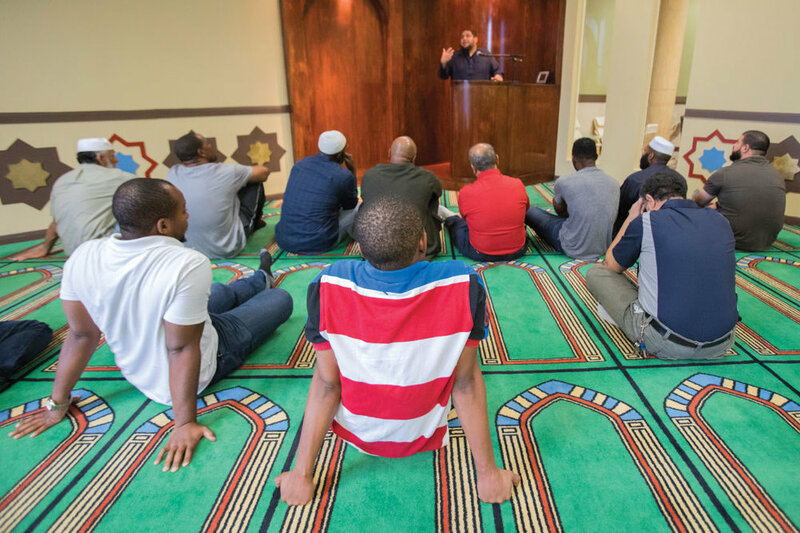 At Centro Islámico, on Houston’s far southwest side, it’s led by Imam Isa Parada. He’s on the young side, stocky and baldheaded in a billowy maroon tunic, with a passing resemblance to DJ Khaled. Before him, several dozen practicing Muslims sit in tight rows facing Mecca, directionally aided by the arched pattern on the mosque’s emerald-green carpet. The service is standard, as jummahs go. Parada preaches lessons from the prophets, about how there’s value in educating one’s community, about the honor of living cleanly, about how “true Muslims” are good to their neighbors. A man delivers the adhan, the traditional Arabic call to worship, in a beautiful tenor voice, clear and true. But there’s something unmistakably unique about the proceedings. Parada is Latino, as are many of the worshippers before him. The language of choice here, the country’s only Latino-focused mosque, is Spanish. Greetings of As-salamu alaykumand buenos días are both accepted and encouraged. As far as mosques go, it’s accommodating and open. Kids roam freely, straying from their designated play area in the corner. Non-Muslims are encouraged to sit and observe, on leather couches in an adjoining lounge or in the prayer room itself, on a sliver of tile floor toward the back. The design motif is Andalusian, with Spanish arches and pastel colors, an intentional nod to when the Moors ruled Spain’s Iberian peninsula during the Middle Ages. Roughly 4,000 Spanish words derive from Arabic, including basics like camisa (shirt) and pantalones (pants). Latinos, in other words, share Islamic roots, if they look back far enough. "You step into a place like Centro Islámico, and you don’t feel marginalized. You’re able to be Latino and Muslim at the same time. Your identity is whole." Juan Pablo Osorio, 30, first encountered Islam as a Marine, deployed during the Iraq War. “I would talk to interpreters, meet and greet with people, have meals. I would ask them questions,” he says. When the Hastings High graduate returned to Houston, in 2008, he kept reading the Koran, which he found “captivating.” He linked up with Fletcher a couple years ago, and today he does marketing for IslamInSpanish. Osorio’s office is in the back of Centro Islámico, near a mixing board and radio-quality sound studio. On the desk, The Autobiography of Malcolm X is stacked on top of The Latino Wave, a book by Univision national anchor Jorge Ramos. When Osorio reentered civilian life, he was searching for a new purpose and, he says, found it in Islam. The people who he grew up with in Houston, mostly Catholic, are usually surprised to hear about his conversion. But they see how gracious and centered he’s become. The changes are undeniable.